Engage in a little tabletop competition with this fast paced game that sends the pucks flying. 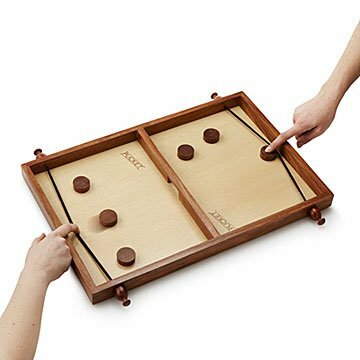 After seeing two jolly old men playing the traditional game table a l'elastique on the street of a town in southern France, David Harvey decided to create his own version of this fun, fast-moving game. Two players, each with eight pucks, frantically flick their pieces through the opening at the board's center. Send your pieces skidding through the gate as quickly as you can and act fast to bounce any of your opponent's pieces that slip through to your side back to theirs. The first player to clear their side of the board wins! Each heirloom-quality game is handcrafted out of sheesham wood by artisans working under fair-trade practices in India. For seasoned Pucket players looking for more challenge, add this Awkward Extension Pack of sixteen strangely shaped pucks—from Mr. Stubby to the Evil Crab's Claw. Pucket includes 16 wooden pucks with cotton carry bag, game board, 2 tension adjusters, and instructions. We leave it out on the coffee table so it is always available for a quick game. Very challenging! Pucket sits out on a table and friends and family constantly sit down for a quick game that always ends with laughter. Seems very sturdy. Little to learn in order to play, and games can be lopsided, but playing it you get better. Everyone loved this! My 8 year old niece played her 82 year old grandpa and they had a BLAST. Everyone wanted to play. The 20 yr old and 40 yr old ended up being the best and had an intense championship game. Really fun to play and watch. Brings the family together gamely! We put this on the table in our showroom for kids to enjoy while their folks are shopping. It is a hit! Fast, fun game that my teenage nephews loved! It was fun to play. We were pretty well matched so was hard to win and my hands actually started to get tired. I tried to call in a substitute but my nephew was not okay with that so we called it a draw! Fabulous game in this current age to bring people out of their heads to engage physically. It utilizes the dexterity of phone users and video game players applies it to the game in a real life physical setting. It is engaging and irresistible to the "techiest" teenage nerd. I love what it does to the social dynamic.